direction but Pacquiao is a complete fighter now. Their previous fight Pacquiao only uses his left hand to jab Marquez but right now it's totally different he can use both of his hands especially his right who made a lot of improvements and I should give credit to Coach Roach for his training. Pacquiao, meanwhile, was all praises for his spar-mate in Jorge Linares, especially during their sparring sessions. He said although Linares is a lightweight fighter, the Venezuelan boxer is a smart and clever fighter the same trait Marquez has. I think Linares is the best option out there for Manny, and we have lined up several boxers for Pacquiao when he works out in Los Angeles. Sparring sessions have already started since last week and Roach said they plan to trim down the rounds of sparring for Pacquiao. Pacquiao sparring sessions normally have 150 rounds of sparring but this time they'll be going to have only up to 100 rounds. So what do you think of this Pacquiao vs Marquez 3 fight? What will be your own predictions on this Pacquiao vs Marquez 3 bout. 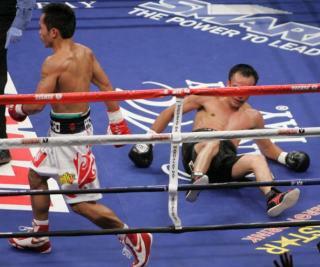 Do you think Pacquiao will end Marquez in the early rounds or Marquez will give Pacquiao another good fight like what he did in their previous two fights? Hmmm...I'm happy to know what will be your own predictions to this fights.